This 30 wears post has been a while coming, after I hit 30 wears on this cardigan in spring last year. It just didn't feel right to post about it over summer though. 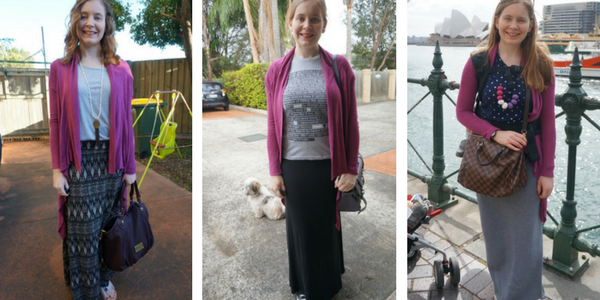 Now the weather is cooler and it's officially winter here in Brisbane, I'm happy to share some of the 30 ways I've worn this cardigan in the past. I even managed to find some of the ways I'd worn it before I had the blog so I could share that with you for something different. The past few times I've done a 30 wears post I've managed to calculate the cost per wear. Unfortunately, I bought this cardigan so long ago, I can't remember what I paid for it. I've only photographed my outfits consistently every day since I started this blog in 2012 so I'm not sure exactly how many times I've worn this. There have been over 33 times I've photographed it and I'm pleased with that. The earliest pic I could find was winter 2011, so it's at least 7 years old and still going strong. One of my early blog pics there in the middle! It's fun seeing how things have changed. I used to have to balance my camera on the BBQ and use the self timer, so often it wasn't aligned properly. I much prefer the other pics, taken with my camera remote and tripod. No matter what the photos look like, I love each of these outfit ideas though. I really like the way this cardigan looks belted. It's something a bit different, and good in the middle of winter as it keeps you warm as the cardigan stays closed in place. It makes the draped pieces sit really flatteringly too and almost creates a peplum effect as you can see in the last photo. Each season, Balenciaga come out with new colours for their bags. I always take a liking to the pinks, but the 2005 magenta is my favourite pink. As you can see in the photos above, my current magenta Balenciaga Day bag isn't the only magenta bag I've had, the old selfie in the middle is back when I had the same colour in the city style too. With the touch of pink in this purple cardigan, and the touch of purple in the pink bag, the cardigan and bags are a nice combination. They aren't a perfect match, but the shade is close enough together that I like the almost matchy-matchyness. It's not just similar colours I like wearing this purple cardigan with. Blue and purple is a combination I frequently wear, so I really like navy tops with this cardigan. Of course that last outfit there is my favourite, it was Baby T's first outing after we got home from the hospital. Even though I'm exhausted, my postpartum tum is on display, and we were going to a clinic for breastfeeding help, it was still a comfortable outfit and my favourite photo of the post! Another frequently worn colour combination of mine is pink and purple. With the bright purple colour of this cardigan, it's easy to introduce just a little touch of colour through a small bag like this neon pink mini MAC I'm wearing in the last two photos. If you're feeling bolder or particularly colourful, you could wear it with a pink top too, like I've done with the ombre tank in the first outfit. You'll know from reading my blog (or looking at some of the outfits I've already shared!) that I like my colourful handbags. They are fun accessories with an outfit. And while the deep plum purple of these Rebecca Minkoff bags in the outfits above doesn't match the pinky-purple shade of the cardigan, I think they compliment each other quite nicely! 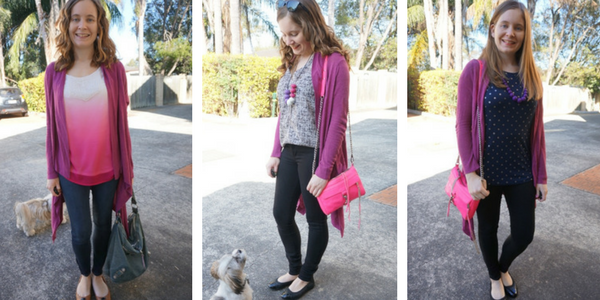 Even if your accessories aren't a perfect match to a colourful cardigan, it's good to give the combination a try - as you can see I loved the little purple MAB tote bag with this cardigan so much I've worn it quite a few times! If you're completely stumped about what to wear with a colourful cardigan, throw it on over a neutral outfit. It can be something as simple as a grey tee like in the first picture, or a monochrome black outfit like the last photo. It also works well with cream and neutrals as you can see in the middle there. 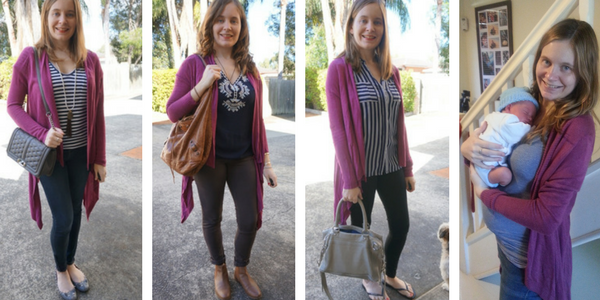 I'm also employing my previous tip above of wearing a purple bag with the cardigan in these last two photos, but you could easily stick with a neutral brown like the Chloe paddington bag in the first outfit. The fun thing with a bright, single colour cardigan like this purple one is that it's so easy to wear with printed pieces in your outfit. The lack of print on it means it will go with anything. Stripes is my favourite combo, as you can see here! But a plain cardigan will go with any print you want to wear. With a loose, drapey waterfall cardigan you'd usually follow the 'one fitted, one flowy' rule to balance your outfit. But I like the casual outfit created with a long maxi skirt and this long cardigan. It's a nice way to wear a maxi skirt outside of summer! And as you can see from the last picture, a cardigan is the perfect piece to wear when babywearing, soft for baby to cuddle up to when he's in the carrier. 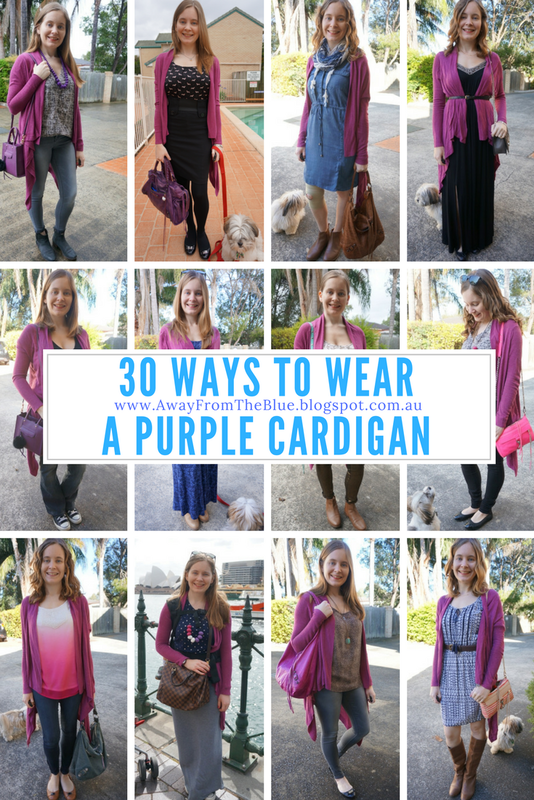 The last way that you can wear a purple cardigan is with dresses! I smiled when I put this picture together as it shows off some of the other things I'd mentioned above! 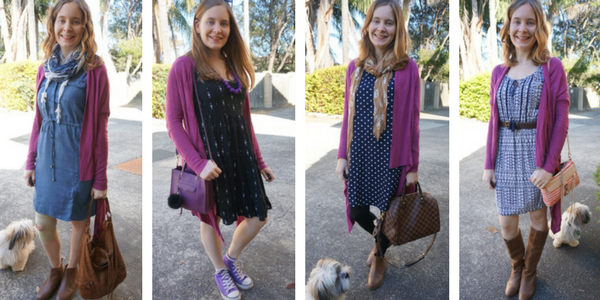 A purple cardigan with purple accessories, a neutral black dress, with blue, and with prints. Just like it does with with maxi skirts, a cosy and colourful cardigan is a nice way to make a spring or summer dress work into autumn, especially when paired with ankle boots! I really like the beautiful purple shade of this cardigan, and I find it so easy to wear. One of those purchases that's proved it's worth in my wardrobe. I have had to spend a little more than what I originally paid on it after I accidentally snagged it and got a hole in it. Thankfully my tailor repaired it very affordably, and this cardigan will continue to be worn and loved in my wardrobe for a long time still. Hopefully these outfit ideas gave you some ways to wear a purple cardigan, or even just a colourful cardigan, that you own. If you don't have one, it is very versatile as you can see from the outfits above, so I've included some similar pieces below you can shop. Want more outfit inspiration? All of the 30+ ways I've worn this cardigan on the blog. Linking up with Flashback Fashion, Lizzie In Lace, Flashback Fashion, Style Wise, Shoe & Tell, Mix It Monday, Modest Monday, Hello Monday, On Mondays We Link Up, On Trend. Happy blessed June and hope your week is going well. The color of your purple cardigan is beautiful. It's not dark or too light, just the right hue. I really enjoy seeing you 30 wear posts because it is inspiring. The times I think I have nothing to wear is not true because you prove this statement wrong by letting me know there is more ways than one or two or three to wear an item. Wishing you a happy weekend! This is a very versatile coloured cardigan, I like the ones you paired with dresses, that is so hip. I can't imagine you taking picture every day, you must be very organised and a multi-tasker. It's getting colder here in Sydney, I wish I live in Qld where it never gets this cold. We'll be watching Vivid next week while it's here and that's the only good thing to have in the winter. Wishing you a fun weekend! I take a pic every day on the way out the door, I'm so used it it by now it doesn't take up much time. THank you! Hope your dinner went well! So impressive that you've had this over 7 years and still wear and love it. I like the color and draping. Yes! It's lasted such a long time! 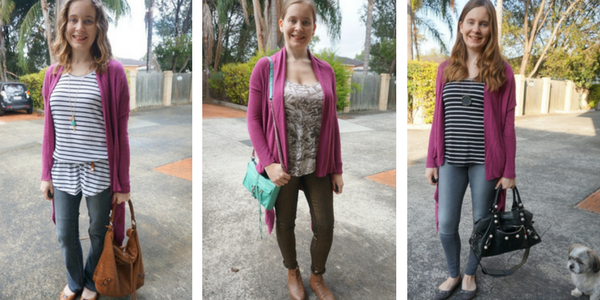 I love seeing all the ways you styled this cardigan! The purple color is beautiful, and I love how it adds a pop of color to all of your looks! Such a versatile piece Mica! It looks completely different in every look. I hope you have a wonderful weekend! You have the best suggestions on how to wear one piece! You look so lovely! Wow I have to hand it you this is impressive. Not sure if I have worn anything in my closet other then a coat, blazer or jeans 30 times. Maybe hmmm I have to give that a think. Every look is great perfectly casual and fashionable at the same time. That is a great colour, like Maureen says - it really hits that sweet spot of not "too" anything. I'm always so impressed that you get so much wear out of some of your basics - who'd have thought that a purple cardi would be so versatile! Have a great weekend, Mica! Thanks Sheila! :) It is nice to see all the wear I've gotten from this! I love that cardigan! The color is so pretty and the drape makes it work so well in both casual and dressier looks. I can't pick a favorite here! I love the outfits with pink, and I also like all the looks with dresses. I love the color paired with navy blue as well. And how cute is that pic of you and your precious boy?? Thanks Shea! I'm glad I have that pic, he was so tiny there! 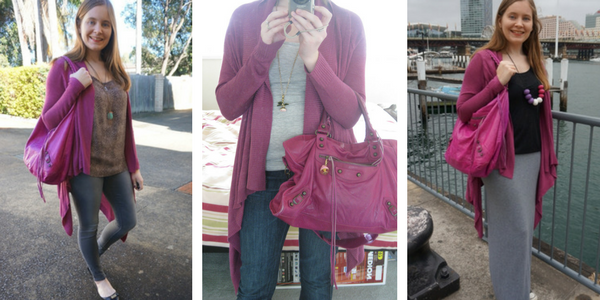 Who knew that a purple cardigan could be so versatile?! I love these kinds of posts; you're always so good at mixing and matching. Thanks for sharing and I hope you have a great weekend ahead! You do such an incredible job of getting fabulous use out of your clothing items, Mica!! 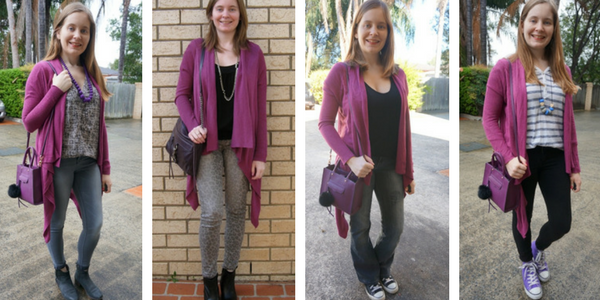 And it's so great to see how many combinations this purple cardigan can style!!! Thanks it's good to see the different ways you can wear things! Wow, what a fantastic post! That is definitely a versatile piece. I love that it adds the perfect pop of colour to just about any look! Wow what a great post on getting more use out of a cardigan! Thanks Emmy! There are a lot of good memories with this cardigan! Mine is burnt orange, and while I love it for fall, it feels a little out of place in summer. And yes, we do need cardigans in summer here in Germany. You have always great ideas on styling the same garment. That cardigan is super cute and i loved to see him with the belt. I wish you a great weekend i m ill and im in bed my weekend is a mess. Sorry to hear you have been unwell, hope you are feeling better now! I never would have thought of belting a cardigan but it looks fab! Love the colour of this. You for sure got your use out of this cardigan. Love all the different way you have worn it. You so gave me the idea of wearing purple and pink together. Have a great weekend. I love the way you styled the cardigan. It looks so cute. So many options, really versatile. 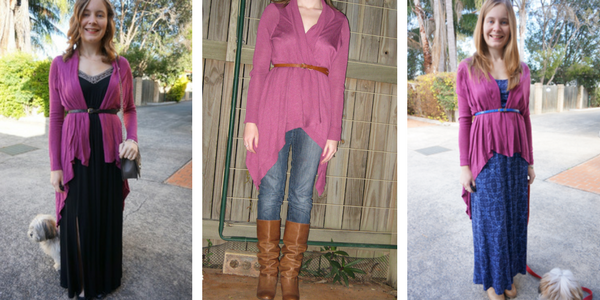 Great ideas to style a purple cardigan. I love all of these outfit ideas. Fun dresses plus caridgan is a lovely outfit formula. I love that collage and you styling tips are always spot on. So nice you had this cardi for a long time and got many wears out of it...Very stylish outfits, all of them. My favourite outfit is when you wore this pink cardi with the black maxi dress. Love this post! Purple is the one of my favourite colour! wow never thought a purple cardigan can be worn in so many ways! I totally love the colour of your cardi! Such a versatile item, it can be combined with any pieces in your wardrobe. 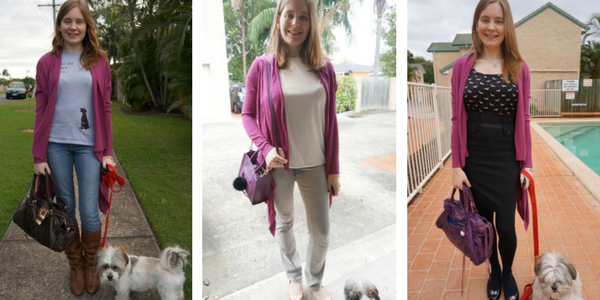 What a great variety of outfits to go with the purple cardi! And the post-partum photo is my favourite too - it's easy to forget how tiny those little babies are! They do grow up so fast! I'm glad I have photos from when they were little! This cardigan is a great piece. I love the colour and how versatile it is. Hope you are having a lovely weekend. What a versatile piece! Love this color on you. This is such an awesome idea. I love the belted idea. I've never thought of doing that! I love all these outfits but the one with the ombre top is my favorite! The ones with the dresses are cute too! Glad I could give you some outfit inspiration! Obviously, I was very excited by the title of this post haha! You had me at "purple," Mica! :D These outfits are so cute! haha yes, definitely your kind of cardigan and post! Such a cute cardigan! It really is so versatile! I love all the ways you styled it! This is such a great post! I bought a purple cardigan this season and have managed to wear it about 5 ways...but this has given me so many more ideas! This is one of my favorite colors! Love how your styled it! Hope you had a great weekend! What a great cardigan! It's such a pretty shade of purple too! I love all the ways you've worn it. 30 wears is so impressive! Wow Mica, this cardigan has come a long way ! What an amazing collection of outfits and let's talk about that CPW! I wish I knew the exact price to calculate cost per wear, but it was so long ago!